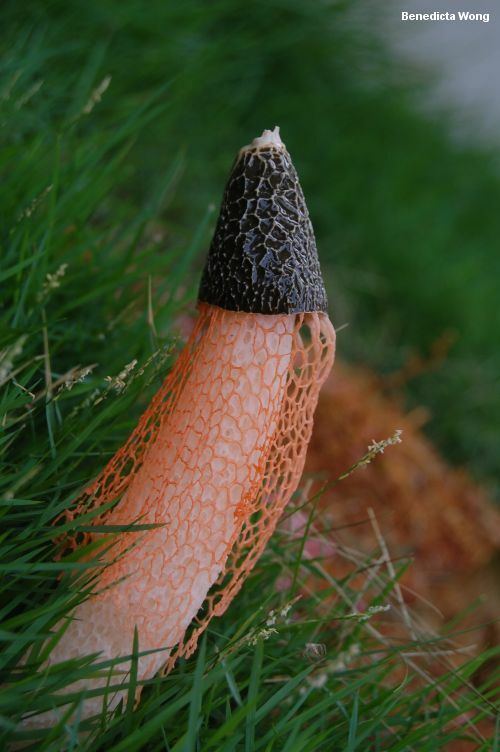 A flashy version of Phallus indusiatus with a cinnabar red (rather than white) skirt, this gorgeous stinkhorn is recorded from Asia, Australia, Hawaii, Central America, South America, and southern Mexico. 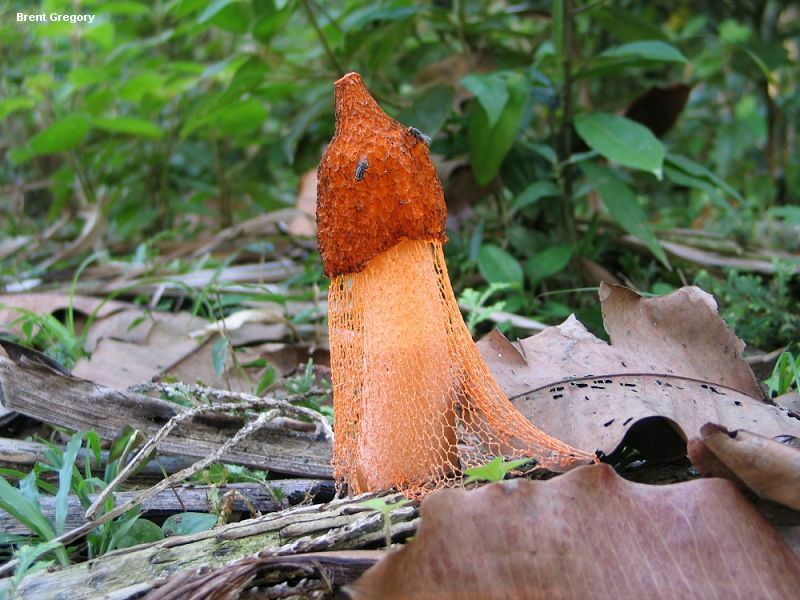 The cap is initially covered with brown to olive-brown, spore-packed goo--but as flies and other insects remove the material the cinnabar surface of the cap is revealed. Dictyophora cinnabarina is a synonym, as is Dictyophora indusiata f. rosea in the sense of Guzmán, Montoya & Bandala (1990). 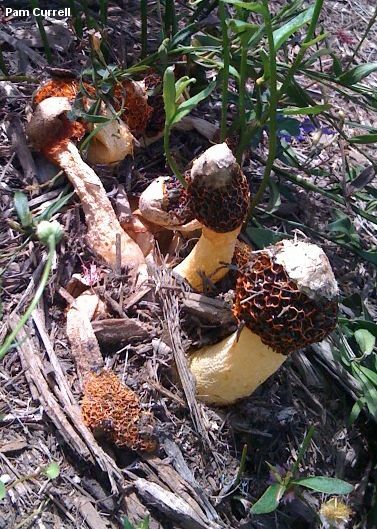 Ecology: Saprobic; growing alone or gregariously in woods and in urban settings; appearing year-round; distributed in North America from roughly the 24th parallel southward (southern Mexico); also common throughout the tropics, nearly world-wide (but possibly absent in Africa). Immature Fruiting Body: Like a whitish or brownish "egg" attached, at the base, to pinkish rhizomorphs; when sliced revealing the stinkhorn-to-be encased in a gelatinous substance. Mature Fruiting Body: Spike-like; to 20 cm high; with a cap that is pitted and ridged at maturity, and covered with a slimy, olive-brown substance that eventually wears off (or is carried away by flies), exposing the cinnabar red surface; usually developing a perforation at the top; with a white stem that arises from a whitish to brownish, gelatinous, sacklike volva; with a laced, cinnabar red "skirt" hanging up to 10 cm from the bottom edge of the cap; odor unpleasant or strongly sweet. Microscopic Features: Spores 3-4 x 1.5-2 µ; long-elliptical to nearly cylindric. REFERENCES: (Lee, 1957) Kreisel, 1996. (Guzmán, Montoya & Bandala, 1990; Calonge, 2005; Hemmes & Desjardin, 2009.) 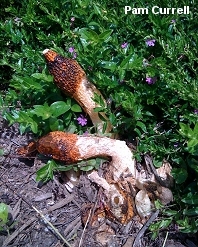 I have not collected this mushroom.